When New Jersey Gov. 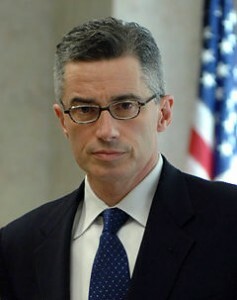 James McGreevey announced his resignation Thursday, explaining that the circumstances surrounding his affair with another man could hamper his long-term ability to govern, the immediate controversy surrounded the affair and whether he was right to resign. Now, the controversy surrounds the timing of McGreevey’s resignation, with politicians in both parties calling for him to speed up his exit. If McGreevey does decide to step down before Sept. 3 – the deadline for a special election to take place – a number of Democrats want Sen. Jon Corzine to step in and run for the job in November. The Newark Star-Ledger reports Corzine is open to the idea and that U.S. Rep. Robert Menendez – who wants to run for Corzine’s Senate seat if it becomes vacant – is preparing a news conference calling for McGreevey’s immediate resignation. A special election opens lots of questions for Democrats, as less than three weeks remain before McGreevey would have to resign and the party would need a replacement lined up. Corzine, who the New York Times describes as New Jersey’s most popular politician, would seem a sure winner. But he’s probably more valuable to the Democratic Party in his current role. As chairman of the Democratic Senatorial Campaign Committee, Corzine is a key figure in coordinating the party’s quest to recapture the Senate, with a number of seats up for grabs. Not only would it be difficult to continue that role while campaigning for a job himself, but it would be equally difficult for the party to replace Corzine with such little time left before Election Day – and it undermines the message of the Senate’s importance to have a prominent senator leave the body for another race.